Non-return Check Valve or one-way Check Valve is a mechanical device, a valve, which normally allows fluid (liquid or gas) to flow through it in one direction only. A Check Valve can also be used for isolation purpose. There will normally be regulations telling how many and in which location Check Valves are to be installed in the process. 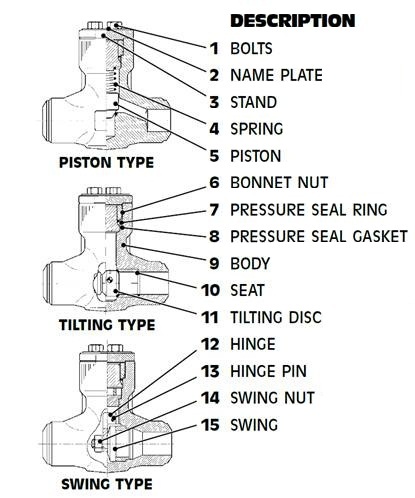 As for most valves there are a lot of different designs of Check Valves. The basic design is a Duo Check Valve with two discs mounted on an hinge pin in the center of the Check Valve. The Check Valve has a standby closed position with springs pushing the discs towards the seats. These valves are designed for installation on a horizontal line where the hinge pin is placed in a vertical position. To reduce space and weight these Check Valves are often delivered as wafer valves. J.D. Check Valves [NRV] are Swing Type and Bolted cover Construction. The one piece disc construction is securely fastened to the hinge by means of a lock nut & pin. The Disc is free to rotating type to avoid any other wear. The hinge pin offers excellent wear resistance properties. Swing Check valves also can be supplied with Titling disc design, Dash pot arrangement and outside lever & weight design for use where control of the disc is desires. J. D. Controls also offer P.T.F.E. (PFA / FEP) Lined Ball Type/Y Type & Rubber Lined Flap Type Check Valves for high corrosive application. Size Range - 1" to 12"
Body & Cover made from high quality casting with liberal sections. The castings are precision machined for high performance. Body Seat Ring & Disc machined to close Tolerances providing smooth action and accurate seating. Stellited Seat Ring & Disc also be offered on special request. In built wear life for long duration in service. Swing check valves feature a simple design complete with a disc attached to a hinge at the top. As fluid passes through, the valve remains open. When a reverse flow occurs, the changes in motion as well as gravity help to bring down the disc, effectively closing the valve. These types of check valves are commonly used for firefighting and flood prevention in sewage systems. They’re also designed to work with materials such as gas, liquids, and other types of media. Stop-check valves can be used for many applications. They’re designed to start, stop, and regulate the flow of materials, and they help to prevent backflow. If pressure in the system is too low, these valves will automatically close to prevent reverse flow. As a result, damage usually caused by backflow is prevented. These types of check valves also work with an external mechanism or an override control. With these, you can set the valve to close regardless of flow direction or pressure to ensure safety and efficient operations. Generally, stop-check valves are used in power plants and boiler systems. They’re also beneficial for petroleum production and refining, hydrocarbon processing, and high-pressure safety services. Unlike other valves, ball check valves use a spherical ball inside their bodies to help control the flow direction in pipes and systems. This ball rotates freely when fluid passes through the system, which causes a wiping motion and even wear between the ball and seat. According to Valve Magazine, this unique action makes ball check valves ideal for systems working with viscous materials. If pressure decreases or reverse flow is detected, the ball will move toward the seat. This creates a seal and helps to maintain the appropriate direction of fluid flow. Ball check valves are one of the most common valves available. Industrial systems as well as common household items use them. In fact, The Valve Pipeline states that ball check valves can be found in liquid or gel mini-pump dispenser spigots, spray devices, and manual air pumps. On top of that, ball check valves are used for metering pumps and chromatography pumps as well. Silent check valves are incredibly useful for water pipelines and systems. These valves are engineered to control and protect against pressure surges that can occur in water lines. They also work to prevent water hammer and reverse flow. Silent check valves are constructed with a spring-assisted disc. When fluid pressure in the valve is higher than the cracking pressure, or the pressure needed open or close the valve, the spring lowers the disc to prevent reverse flow. These unique CPV valves control hazardous pressure surges and water hammer far more effectively than traditional swing check valves. A specially engineered stainless steel helical spring initiates instant closing at zero flow velocity. Since swing check valves do not close until reverse flow begins, pressure surges are never allowed to build. CPV Silent Check Valves are available with precision machined metal-to-metal seats for general service or soft seats for bubble tight sealing to 250°F (121°C). Silent Check Valves are available in a wide variety of styles and materials, in sizes from ½” NPT to 24″ flanged and pressure ratings from 125 to 2500 psi. CPV Silent Check Valves are ideal for applications like heating systems and condensate return lines with pressures to 300 psi. They come with a soft seated closure disc as standard to 250°F (121°C). A stainless steel disc can be substituted if anticipated temperatures are up to 350°F (177°C). Other available options include the use of bronze for the body, union nut and tail piece; a stainless steel guide, retaining ring and spring (Catalog 36), steel body and stainless steel disc (Catalog 34) or all stainless steel, type 18-8 (Catalog 37)  Sizes are from ½” to 2″ NPT. Citizen Metals Forged Steel Check Valves are manufactured as per BS-5352 Standard and Tested to BS-5146 Standard. Citizen Metals designed piston type lift check valve incorporating self-cushioning effect. Citizen Metals Forged Steel Lift Check valves are available under any Third party inspection.